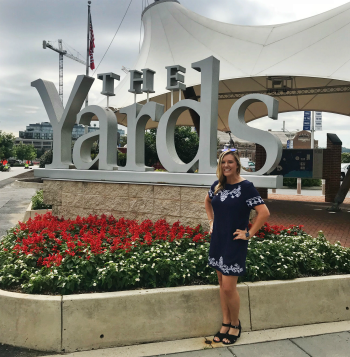 Capitol Riverfront resident Falon Sweeney leads regional brand marketing in the DC Metro area as well as Philadelphia, PA for popular salad and grain bowl restaurant Sweetgreen. "Having grown up in the South Shore of Massachusetts, being able to live close to the water was important," says Fallon. "From the unparalleled sense of community to the variety of activities happening by the water, I knew I was at home. How would you describe Capitol Riverfront to friends/visitors? I always say it's DC's most fun up and coming neighborhood. This area has so much going on! It seems like there's a new restaurant opening every week, and there is always something exciting to do. I really see it as the place to be in DC right now, whether you're looking for a fun place to brunch, a good spot for dinner, or to just hang out by the waterfront - there's so much to offer. What has been the most significant change you've seen in the neighborhood since you moved here? Definitely the amount of buildings that have gone up in the past year, all the new dining options, and how many people are flocking to the neighborhood to explore it. It's been fun watching and supporting all the new businesses as they open up! As a member of the Sweetgreen marketing team, you frequent the popular, healthy lunch and dinner spot at The Yards. What menu items would you recommend? It’s so hard to choose! There are tons of different options and our menu changes seasonally, but I have to say the Chicken Pesto Parm and the Mexican Corn Elote bowl are my two favorites. If you’re a first timer at sweetgreen, definitely order off the menu instead of making your own. Our chef curates our menu offerings based on different flavor profiles and what’s in season, so you’d be remiss not to try one of his creations! When you’re not dining at Sweetgreen, what is your go-to for a meal or to hang out in the neighborhood? I really love to cook, so Monday through Thursday you can usually find me grilling on our rooftop during the spring and summer if I’m not eating sweetgreen. At least a few nights a week, I take a walk along the waterfront to enjoy the neighborhood and unwind after work. I also really love all of the fitness studios and workout options in the neighborhood, and am crossing my fingers a yoga studio opens up here soon! Since summer is right around the corner, what is/are your favorite Capitol Riverfront summer event(s)? Between Nats games and the Friday night concerts on the riverfront, plus everything happening at Up Top Acres, I stay pretty busy. I have to admit, I love meeting up with friends at the bullpen, whether or not we’re headed to a game afterwards. It’s such a fun atmosphere and a great place to hang out on a Friday evening. This summer, I’m particularly excited about the All Star Game coming to town and think it’ll be such a unique moment for the neighborhood and our city! First, welcome to the neighborhood! Once you get settled, make sure you check out all the bars and restaurants – my favorites are The Salt Line, Whaley’s (snag a spot at the Rosé garden! ), Declaration, and of course, sweetgreen! Also, get to know your neighbors and your building staff! There are so many interesting and wonderful people who live and work in the neighborhood – you never know who you’ll meet by striking up a conversation while relaxing by the pool or at happy hour. We’ve made a lot of friends over the past year by doing that!